Tiger Woods is not admired by many in vain. Going 18 holes in the sun or rain can be exhausting. Also, having a powerful swing to achieve “hole-in-one” is not as easy as it looks on television. Although it seems a calm and low intensity sport, golf is also demanding with your body and you can easily hurt yourself. Before going to the tee, get ready! Many believe that to play golf you only need to buy the clubs and have a good “swing”. But the issue is not that simple, because you also need to have a good physical condition, strength and flexibility to hit hard and travel the entire field. If you are not well prepared physically, you can get tired quickly or even hurt yourself with a wrong movement. Warms . As in any sport, you need to warm up your muscles before you start. Every time you swing to hit the ball, you are moving the muscles of your hands, wrists, arms, back, shoulders, waist, abdomen and legs … almost your entire body! Start with a bit of cardiovascular exercise (walking or jogging) and then do stretching to avoid hurting your muscles and so that you have more flexibility in your swing. Exercises . 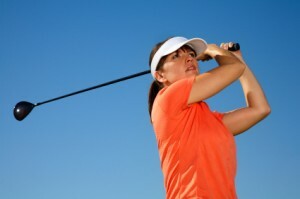 Exercise regularly to keep your body in good condition and with resistance to travel the 18 holes without running out. Aerobic exercises such as walking, jogging, swimming, skating or riding a bicycle are ideal. Strengthen your muscles . Have you seen the arms of golfers? The stronger your muscles are, the faster and stronger your blow can be. Also, less chance you will have to hurt them. Do strengthening exercises continuously, even in seasons when you do not play, to keep your muscles strong and prepared all year long. Learn If it’s the first time you play golf, do not beat yourself without knowing how. A wrong swing can hurt your back, shoulders, arms, wrist or knee. Enroll in a class to be taught the swing movements and how to achieve them safely. Use the whole body. Have you heard about the “golfer’s elbow”? It is a typical problem that arises when you injure the inner muscles of your arm by putting emphasis on the hands and wrists when striking. When practicing your swing, remember to use your whole body to give the blow, and not concentrate the strength only on the arms or wrists. Keep the position . Your position is important to give a good blow and not hurt yourself. Stand in front of the tee (the small support for the balls that sticks in the ground) with your feet separated and balancing your weight in both. Try to stay upright and relaxed to avoid hurting your neck and back when you swing. Do not overdo it . Do not push your swing thinking that the faster or stronger you hit the ball, the better you’ll get. On the contrary, you can miss the blow easier or hurt some muscle. It is better to give controlled but accurate blows. Without shoes, there is no game . The golf shoes are key to supporting several hours of walking through the field. In addition, they have a kind of tacos that are buried in the grass, giving you firmness in your movements. Comfortable clothes. Wear pants and shirts that keep you cool, especially when it’s a hot day. Also look for comfortable clothes that allow you to move freely. Take care of the sun . The sun can be your ally, but also your enemy. A sunny day can burn your skin, sunburn and dehydrate you if you do not take care of yourself. Always have hats, sunglasses, and sunscreen on hand to protect you. Stay well hydrated and alert to any signs of dehydration or insolation such as headache, dizziness, nausea or tachycardia. How to carry the bag? The bag of the golfer is the one that keeps the complete equipment: equipment of sticks, balls, tees, towel, etc. Some experienced golfers carry it on their shoulders for the 18 holes. But it may be too much for you if it’s the first time you play or if you have any physical limitations. You can get a hand cart to pull or pull it, or use an electric car to avoid walking to each hole. Little by little you will go through the 18 holes without realizing it, and you will look forward to finding you on the tee with your best friends.